Software: NetEnt, WMS Williams Interactive, Microgaming, and Play ‘n Go. Games Available: Over 350 games, including: Video slots, Video poker, Blackjack, Roulette, and Classic slots. WixStars Casino is owned by BrightNet and is licensed in Malta and also holds a license from the UK Gambling Commission. WixStars is a newly launched NetEnt casino in 2017, and offers a wide selection of games from the top software providers, including: NetEnt, WMS Williams Interactive, Microgaming, and Play ‘n Go. *Only players residing in these countries are eligible for this exclusive welcome offer: Austria, Finland, Norway, UK, Canada, Sweden, Denmark, Ireland, Netherlands, New Zealand, and Switzerland. 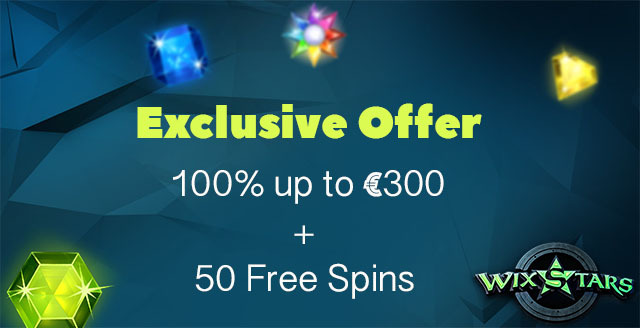 *New players at WixStars Casino can take advantage of our Exclusive Welcome Bonus of 100% up to €/£/$300 + 50 Starburst Free Spins. Make a minimum deposit of €20 or equivalent to qualify for this Welcome offer. ** Players must be 18 years or older to sign up for an account at Wixstars Casino. Click here for a list of the full Terms and Conditions. The wagering requirement for the Welcome bonus is 25 times (deposit + bonus). You must deposit a minimum of €20 for the Welcome bonus offer. 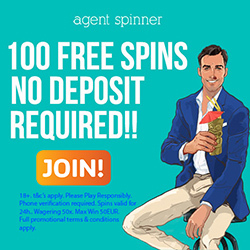 The wagering requirement for the No Deposit free spins is 50 times and the maximum cashout is €100. Restricted players at WixStars Casino: USA, and South Africa. Players that reside in these countries are restricted from accepting bonuses or free spins: Ukraine, India, Poland, Greece, Czech Republic, Slovakia, Serbia, Armenia, Hungary, Croatia, and Russia. The deposit options at WixStars Casino are: Neteller, Skrill, Paysafecard, Sofort, Ecopayz, Zimpler, Visa Credit Card, Visa Debit, Mastercard, Maestro, iDeal, GiroPay, Entropay, EPS, ClickandBuy, POLI, UseMyFunds, Trustly, Ticket Premium, Boleto Bancario, Bancontact/MisterCash, instadebit, and Siru. You can deposit using the following currencies: GBP, EUR, USD, AUD, CAD, NOK, and SEK. For any queries, the customer support team is available via Live Chat or Email.